Back-Up Story: "The Origin of Hawkman and Hawkgirl"
The Marvel Family flies the Question and Renee Montoya to the Himalayas. Before leaving Black Adam, Osiris and Isis say their goodbyes and once again thank the two for everything they have done. Soon after the Family departs Renee and the Question are joined by Aristotle Rodor and then by Richard Dragon, the man who trained the Question and now the man who will train Renee. John Henry Irons appears on "You Are Wrong" hosted by Jack Ryder. The subject is the recent debacle with the supposed Justice League and Jack Ryder wants to find who is to blame, all in the name of ratings. John Henry argues against Luthor's Everyman Project before being joined by his niece Natasha in her guise as Starlight. The two argue before Starlight is called away on an emergency, though she gets in a dig at her uncle before doing so. The Sivana family welcomes the Marvel family to dinner. Venus Sivana had previously donated twenty million dollars to Kahndaq's Children's Hospital so that they would accept her invitation and then implores them to help find her missing husband. Elsewhere on Oolong Island, the mad scientists are in something of tizzy over the newest addition to their rank, a woman by the name of Dr. Cale. Once they find out that she is extremely attractive they fall all over themselves to assist her. Back at the mansion dinner Black Adam agrees to take searching for Sivana under advisement and gives his word that if they do find him that they won't harm him. Osiris is uncomfortable with the whole situation and feels that they should be fighting the Sivana family not eating with them. He storms out just before one of Sivana's experiments that had been accidentally released before the Marvels' arrival slams into the table. It quickly escapes, but is soon found by Osiris who discovers the creature's origin and quickly befriends him. "The Origin of Hawkman and Hawkgirl"
Centuries ago Prince Khufu and his consort Chay-Ara were murdered by an Egyptian sorcerer. Their love proved to be eternal as the two souls were reincarnated again and again, always together and always fighting for justice and honor. In their most recent incarnation Khufu, now Carter Hall, managed to cheat death while Chay-Ara, now Shiera, didn't. Unwilling to separate from her beloved, Shiera held on to her current life by intermingling her soul with her grandniece's, Kendra Saunders. Kendra may share Carter's drive to heroism but she has no memories of her previous life, which has made romance between the two complicated. Still, they fight together to protect the people of St. Rock, Louisiana against threats foreign, domestic and intergalactic. Main Story - 5: I dug the title to this issue's main story. It's the halfway point of this series, the title has halfway in it. I'm not quite sure why I find it amusing but I do know it is quite appropriate. As much as I hate to say it I am rather surprised that the series has come out on time week after week. Given the fact that certain other titles (like TEEN TITANS, GREEN LANTERN and the perpetually delayed SUPERMAN/BATMAN) have had such scheduling problems I was pretty sure that this book was going to fall prey to that. I'm glad that 52 has been on time, just a bit confused as to why they can get this series, which is rather complicated in design and execution, out and not some of their monthlies. Maybe it's the rotating artists. Who knows? At week twenty-six we get the best issue so far. Not only in terms of my personal tastes but also in terms of the writing. Then again it started and ended with Black Adam, Isis and Osiris, who have become my favorite characters and the plotline I most look forward to reading so I may be a tad biased there. It has been nice to see Adam's progression as a character and while it may seem a little clichéd that all it took was the love of a good woman to even out his temperament I still like it. It was almost heartwarming to see all the love on the mountain top between the newest Marvel family and Renee and the Question. I also thought it was freaking awesome that the Question has hooked Renee up (figuratively of course) with Richard Dragon. That is fantastic. I am all about some of that because Richard Dragon is such a great character and his latest series never really had a chance. If the writers (and I would hazard to guess that this was either Rucka or Johns' idea, but I could be wrong there) wanted to elicit interest in upcoming issues then they certainly succeeded here. I don't even want to guess where this could go; I just want to see it. The "You Are Wrong" chapter was another strong scene. Jack Ryder is one of those characters that I prefer as an annoying talk show host/rabble rouser over the other identity of the Creeper, who I really don't care for at all. The Bill O'Reilly vibe the writers give Ryder makes for a compelling character to use for exposition. The confrontation between Steel and his niece played out well too and I especially liked the fact that Natasha was able to do the talk show thing of making her uncle look foolish by pointing out something that she is going to go and save people while he is welcome to stay and be on television. It's like asking someone if they have stopped beating their wife; there's no looking good there. He could stay and argue the point thus proving that all he wants is to be on television or he can run off and help save the people of Hob's Bay and look like he has something to prove or that he is trying too hard to prove that she is wrong. It's lose/lose all the way and that really comes through in that last panel where John is left without his niece and Ryder moving on to the next topic. The brief scene on Oolong Island was funny. There's no other way to describe it. The mad scientists turn into complete idiots when a good looking woman walks in the room. That was priceless. Finally we have my favorite part of the issue. Again I'm a bit biased here because I do have a lot of affection for the Shazam related characters, but even still the introduction of the Sivana family was amusing and very well written. It's interesting to see how the Shazam characters are getting divided into families or at least it is interesting that the writers are playing up this aspect of that little corner of the DCU. The Sivana family is twisted. There is no other way to describe it. They are dysfunctional with a capital D. Watching Junior and Georgia "play" in the basement and wanting to use time travel to undo embarrassing moments from Junior's past or to ensure that Georgia will get braces and be beautiful like her sister Beautia was great and then seeing the disparity as far as how Venus treats the children who take after her and the ones that are obviously Sivana's made me almost feel bad for them. Venus herself is a despicable character, not only because of the way she plays favorites with her kids but because of the camel jockey remark. That actually shocked me a bit because it is rare to see such a slur getting thrown around in a DC comic, but at the same time it was supposed to shock me, so I liked it not because I agree with her sentiments (which I don't, I want to make that clear since these things can be taken out of context) but because the writers engaged me. The use of the slur was designed to provoke a reaction, and it did. Osiris is developing nicely as a character as well. When he first became Black Adam's Captain Marvel, Junior (though at least Osiris can say his own name) I thought it was such a brilliant, obvious concept and like Junior he wants to fight the good fight, just like his benefactor/big brother. Now that Black Adam is becoming less the knee-jerk/jump into action guy and more the diplomat thanks to Isis' influence Osiris can't turn it off. His assertion that they should be fighting the Sivana family not breaking bread with them or making deals emphasized this. So instead of coming off like a petulant teenager he looks like a young man who is frustrated with the roles his family has to play. And he gets a talking animal friend too, which mirrors Junior and the rest of the Captain Marvel family as well, which made me smile. It almost makes me sad, though, because with the huge revamp that the Shazam characters (or at least Freddy and Billy) it seems that all of the great things being done with Black Adam and Isis and Osiris and now the Sivana family may not be around after this series wraps up. I could be wrong because something could happen to allow for them to have a life after 52 but given how the direction the DCU has gone in for the past year I'm not going to pin all of my fannish hopes and dreams on it. So here we are, at the halfway point. I may not dig everything that happened in the opening weeks but over the last month or so this comic has crept higher and higher to the top of the reading order of the books I buy. This has been such an interesting experiment in doing a weekly book and I am looking forward to the next half to see how these plotlines wrap up, if they do. Art - 5: Like the writing this issue has had what I consider some of the strongest art the series has seen thus far, which is saying something because the art has been consistently excellent for twenty-six weeks. I keep harping on this but it all goes back to the fact that one of the best artists in terms of designing a page is doing the layouts. Keith Giffen's contribution to the art cannot be understated. Having said that I really dug Patrick Olliffe's pencils on this issue, aided capably by Drew Geraci, who is one of the best inkers in the business. In terms of capturing the emotions of the characters the two knocked it out of the park. You could really see what the characters were thinking, even the Crocodile man. There was also a lot of subtlety in the art as well. The scene that introduced Jack Ryder to this issue was fantastic. The different settings, from the living room to the major city street to the diner to the control room let's us see all of the major beats of what Ryder's show was about while giving a snap shot of the regular man's reaction to it. I liked this. 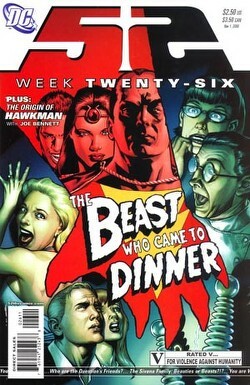 On a different level there was the full page splash of the dinner between the Sivana family and the new Marvel family. There are robot servants circling the table. Osiris is obviously bored. Both Georgia and Junior are stuffing their faces. Magnificus is obviously disgusted by his brother and Beautia looks like all she needs is a mirror and she's set. It was a wonderful page to look at because of all the little touches that Olliffe and Geraci threw in. I would also be remiss in overlooking the scene on Oolong Island. The humor came through strong in terms of write as well as writing. It was a sitcom moment, but the page where Dr. Cale walked in and the panel repeated for a beat made me laugh. It was a bit obvious, but at the same time it worked. I could literally go on about the art, like mentioning the lightning in the background when the Marvel family showed up at Casa de Sivana, but suffice to say the art impressed the heck out of me this month. And I still love Black Adam's cape. I want that freaking action figure. Backup Story - 5: This one gets a five because Mark Waid managed to make perfect sense of Hawkman's history. This is no easy feat since Hawkman was the one character in the Post Crisis DC Universe that was dealt the worst hands in terms of revamps. It was Mark Waid, I believe, who asserted that all of the problems associated with Hawkman could have been avoided if the first issue of HAWKWORLD had the words "Ten Years Ago" written somewhere on it. In any case Waid breaks everything down into a manageable explanation that highlighted the fact that the story of Hawkman and Hawkgirl is a tragic one. Great job, Mr. Waid. You continue to have my respect. Not that should mean anything, mind you. Art - 5: This was an impressive origin mainly because Joe Bennett and Ruy Jose managed to bring in just about all of the incarnation of the Hawkman and Hawkgirl through the ages. They weren't all there, but enough to make the fastidious fan in me satisfied. Bennett and Jose captured who these characters were and made them look good. It was an impressive feat and probably one of the strongest origins so far in terms of the artwork. Cover Art - 5: While I loved the cover they gave to the Halloween issue I have to say that this one would have been a little more appropriate for it. Then again this issue came out a day after Halloween, so it still works. Whatever the case this cover captured the old horror movie poster feel perfectly. The expressions, the composition, everything about this cover works. Like the previous twenty five it is a wonderful piece of art and if DC has a lick of sense they will collect these covers into a hardcover after all is said and done.